The Tour begins. Green Alert. A mid-morning start to a relaxing day of sightseeing. After a Singaporean breakfast of super soft boiled eggs and toast with coconut spread. While we were waiting for people to prepare with passports, thunder started booming around us, with flashes of lighting in the distance. As we were about to leave, a monsoon of rain came down upon us, I was surprised about the sheer volume of watch which came down, however it did show me why there are such large storm drains around the city. We travelled to Kent ridge by train and walked over to the Merlion. We walked past a few stages of people setting up for a festival and sound checking. Then over the Helix bridge to the Marina bay sands shopping centre. 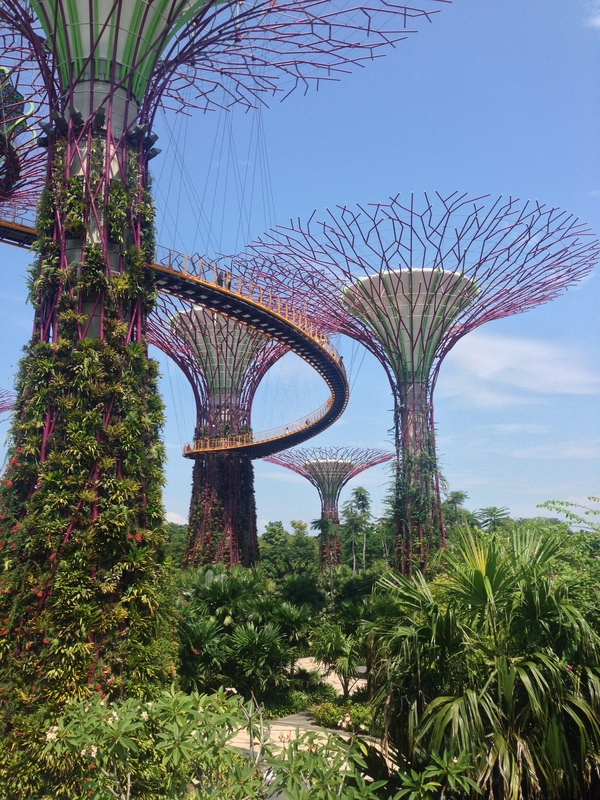 After spending time at the centre, we walked over to Gardens by the bay, which had a massive array of plant life. We went into the flower dome first off which had plants from all over the world, it was very nice to get inside and be out of the very humid atmosphere. The plants inside the dome were very diverse and aesthetically pleasing. The group moved to the Cloud Forest which was a cooler separate dome with a giant mound in the middle with rainforest plants growing off the walls and a waterfall from the top to the bottom. It was an amazing experience to see such a large variety of plants. The first official day of the tour involved us meeting at 10am. After we meet at Starbucks, we were assaulted by an equatorial thunderstorm. The severity and the speed of the thunderstorm surprised everyone except the local, Dong Chen. The first thing on the agenda was heading to marina bay sands and walking down by the riverfront. Lunch was had at the marina bay sands food court and after everyone was gathered we headed to the biospheres. The biospheres were split up into two sections; Flowering plants and the Cloud biosphere. The Flowering biosphere had an abundance of plants from around the world and featured Australia, South Africa, USA and South America.The cloud biospheres featured a central tower with a waterfall and several levels of observation.The main attraction was the plants that were attached onto the outside of the main tower which varied and beautiful, it was obvious a large amount of time had been spent arranging and collecting these plants.So far in this trip i have the impression that the culture of Singapore is to respect plants. 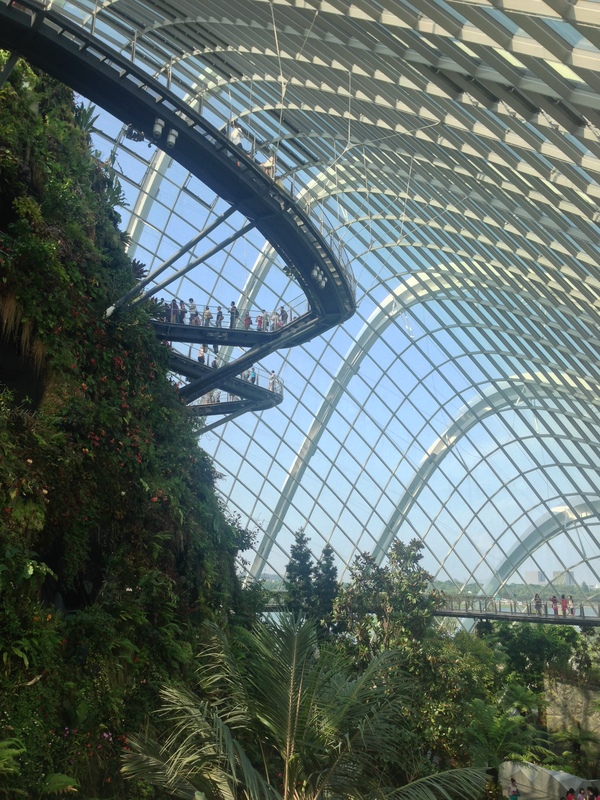 Singapore so far has given me and impression that they have valued having a large amount of plants incorporated in the city however the amount of time, money and effort that has been spent creating the sanctuary of plants that is the biospheres and surrounding areas reminds me more of a temple. Singapore in a way have created a temple that displays the sanctity and respect that they hold towards nature. The Cloud Biosphere in particular reminds me of the ancient legends of the hanging garden of Babylon and like the fabled garden there are many people who travel around the world and ensure they see this wondrous enclosure. This again can be compared to the main place of worship in a country ie. Mecca, Vatican City. The people of Singapore don’t only respect nature, they give me the impression that they worship it and their scared place is the biospheres. It was definitely worth going and grasping a better understanding of the culture.